With three months remaining, the 2016 presidential election is already cemented as a new election archetype -- one characterized by unconventional election warfare, politically incorrect posturing and extraordinary intraparty conflict. In the primaries, Donald Trump's scorched-earth campaigning won the day on the Republican side, yet has prevented him from achieving party unity. At the same time, Bernie Sanders' relatively wholesome assault on the political status quo met many Democratic voters where they are -- tired of Hillary Clinton's personal and political baggage. Nevertheless, she is now the party's nominee. There are more headlines to come in this campaign, and many will focus on the unprecedented high level of unpopularity of both major party candidates. But rather than keep voters home, the negative tone may instead ignite a much higher turnout at the polls than anyone is expecting. We could see 10 million more voters go to the polls this year than in 2012, a prediction made, in part, based on turnout patterns in the past two open-seat contests, 2000 and 2008. In both instances, turnout was significantly higher than in the incumbent re-election year that preceded it. Not only might the open-seat nature of the 2016 election spur higher turnout than in 2012, but because turnout in 2012 was remarkably low relative to the prior two elections, the increase could be magnified. Should turnout revert to the 57% to 58% level seen in 2004 and 2008, we could be looking at 12 million additional voters than came out in the last election -- more than double Barack Obama's winning margin in 2012. Some in Washington, D.C., have suggested that the highly unfavorable images of both Trump and Clinton foreshadow a lower voter turnout in this year's election. But many predictions have failed to come true in this election cycle, and there is good reason to be suspicious of this one as well. For starters, in an election where both candidates have high unfavorable ratings, almost every voter has a reason to come out and vote "against" a candidate, even if they are not eager to vote "for" another. And those who don't like either standard bearer may feel it is their duty to choose between the lesser of two evils -- assuming the greater of the two evils is intolerable. Not unimportantly, there will also be an unprecedented amount of money spent by the campaigns and super PACs cajoling voters to "stop" Trump or Clinton, or to "save" the Supreme Court, "preserve" NATO, "protect" the country's national security, or achieve whatever the sponsor's pet concern might be. Add to that Trump's typical rhetoric and this will surely be a contest that engages voters' emotions -- a perfect incubator for a higher-than-expected turnout. There is already some evidence for this in the data. Gallup polls in late May of this year revealed that 75% of voters have thought "quite a lot" about the upcoming election, up from 63% in January at the beginning of the nomination process. It is also similar to the level in May 2008, notable because turnout in the 2008 election was the highest since the voting age was lowered to 18, and that election garnered the biggest total vote in U.S. history, with over 130 million voters going to the polls. Traditionally, most presidential elections evolve through four distinct stages: 1) A quick buildup of high name recognition based on the premise that voters usually prefer the "devil they know" to the one they don't know; 2) A rapid attempt to create a positive image for the candidate by focusing on accomplishments and credentials; 3) A barrage of well-placed TV advertisements designed to contrast the candidates and drive up the opponent's negatives; and 4) An intense bombardment of positive endorsements in the final two weeks of the campaign. These stages are the normal conventional warfare of campaigns. This campaign is not normal, however, and these normal steps may well be replaced this year. What is left for the 2016 candidates to do now that their conventions are over? The extraordinarily high unfavorable ratings for both candidates have created a situation in which there is very little space left for positive reinforcement through traditional advertising. At the end of the Democratic National Convention Clinton enjoyed a solid edge over Trump in favorability (44% vs. 32%), in part because by that point Trump's convention bounce had mostly faded. 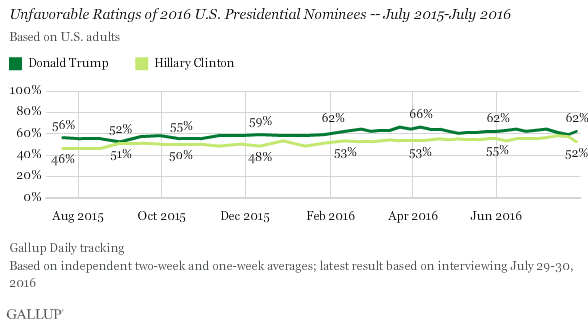 However, even with Clinton's own convention bounce, more Americans still viewed her unfavorably (52%) than favorably (44%). This situation leaves the candidates with one main option -- already well underway on both sides -- to try to reinforce and drive up the opponent's negatives even more. For voters, it may end up quite simply being a question of choosing "the least worst" candidate in a situation in which positives will be in short supply. This is truly an epic contest between two individuals who have not been able to rehabilitate their images with the American public, and thus will resort to making their opponent as objectionable to voters as possible. Both campaigns will operate on the assumption that "nice" is not a winning strategy. The 2016 election has already generated many unfavorable comments from pundits who assume this will lead to general disgust and low turnout, but in reality, we may all find ourselves surprised when the dust settles and more voters than ever get out to the polls to register their choice. The question is, if 9 to 12 million voters come to the polls who didn't vote in 2012, will these be disproportionately Trump or Clinton backers? Will they be the white, working-class voters who didn't show up in 2012, but may have attended Trump's rallies this spring throughout the Rust Belt? Or will they be the lower socio-economic Democrats as well as young and Hispanic voters who chronically don't vote, but will in 2016 to stop Trump? It's too early to say -- higher turnout could benefit either candidate, or it could be a wash.
No matter which candidate wins, half of America will be profoundly disappointed, and the victorious administration will start out with unfavorable ratings so high that it may take years to reverse. Americans' reaction to the Democratic Party's convention was not overly positive, but it was significantly better than their impression of the Republican Party's convention. Hillary Clinton's favorable rating among 18- to 29-year-olds is well below her favorable rating among those who are older, which is a highly unusual situation for a Democratic political figure. The relationship between economic hardship and favorable views of Donald Trump is not as neat as some commentators have suggested. Those who like Trump tend to live in areas far from the Mexican border that are relatively unexposed to trade competition. As Bernie Sanders finds himself under increased pressure from major Democratic figures to quit the presidential primary, he remains more popular among national Democrats than does Hillary Clinton.